Its Robert Frostian reputation meant that even a somewhat battered and bruised appearance couldn’t keep its appreciably low $2,950 asking from piquing interest. In the end, the Land Cruiser racked up a solid 71-percent Nice Price win, and encouragement for its racking up even more miles. If the Toyota Land Cruiser may be considered one epitome of automotive imperishability, what, in contrast might represent its polar opposite? What car may hold the rep for the least reliable, and in fact potentially most under-engineered of all time? While you’re pondering that, let’s have a look at this 1976 Lancia Beta Scorpion, a car that may have had its issues, but is still one of history’s most interesting rides. This one just so happens to call Canada—a nation full of interesting cars—its home. I know, it’s kind of weird to feature a Canadian-located, Italian car on the U.S. Memorial Day holiday, but work with me, okay? The Scorpion featured striking Pininfarina styling which remains drop-dead gorgeous, even in hang dog U.S./Canada form, to this day. That pretty bodywork is wrapped around a mid-mounted engine, and that DOHC sidewinder is accessed via a unique driver’s side-hinged engine cover in back. Under that cover lives an 81-horsepower 1776-cc edition of the Lamprey four. That’s a lot less than the 120-bhp offered up by the 2-litre edition that the Europeans enjoyed. They also got to call the car the Monte Carlo. On this continent, Chevrolet was already selling a car using that name so Scorpion it was. Still, that’s not a bad name. The Beta line, which included the FWD Berlina, Coupe, and HPE, were the first Lancias to be developed post Fiat purchase of the marque. The Montecarlo/Scorpion was in fact originally intended to be sold as the replacement for the Fiat 124 Spider, with the moniker of X1/20. The model turned out to be too expensive and was sent upmarket to be offered as part of Lancia’s Beta line. Somewhat ironically, the 124 Spider outlived the Montecarlo by half a decade. Braking issues damned the model in Europe, causing a two year hiatus in production and sales there. Price and reputation killed much of Lancia’s chances here in the U.S.. This one, in azzurro metallizzato over a coffee and cream interior sports a fabric roof, just over 56,000 miles on the clock, and an appearance that indicates it to be in phenomenal condition. I say phenomenal because while any car could be well maintained, Lancias of this era require special attention. They seem to have one of the shortest half lives of any car ever. What goes wrong with them? Damn near everything, starting with rust and finishing with you crying at the side of the road holding a detached steering wheel, the last intact remnant of your car. That then crumbles to dust before your tear-stained eyes. There seems to be little likelihood of that happening with this Scorpion however, seeing as it’s been around the block a number of times in recent years, and seems no worse for wear for it. Many of you might even be familiar with it seeing as its made an appearance on Bring a Trailer Full of Money on more than a couple of occasions. And, while that usually means an inflated price tag—seriously, BaT bargains are few and far between—in the case of this Canadian coupé it’s been a bit of a wild roller coaster. Along the way though, the car seems to have not lost one bit of its polish nor appeal. Now it’s offered by a Lotus dealer in Vancouver and I have to admit, I may need a new keyboard after perusing that dealer’s pre-owned inventory owing to the drool that’s presently shorting out my current clacker. This Lancia is one of the most unique of the bunch however, and at $15,000 Canadian—which works out to about $11,566 American, or around €9,944 for you Euro lovers—price-wise it’s also at the lower end of their offerings. The question remains, is that a deal? What do you think, is this Scorpion, which is probably one of the nicest you will ever find, worth that $15,000 asking? Or, does this Scorpion’s price sting too much? Vancouver, BC Craigslist, or go here if the ad disappears, eh? H/T to Adam Headland for the hookup! 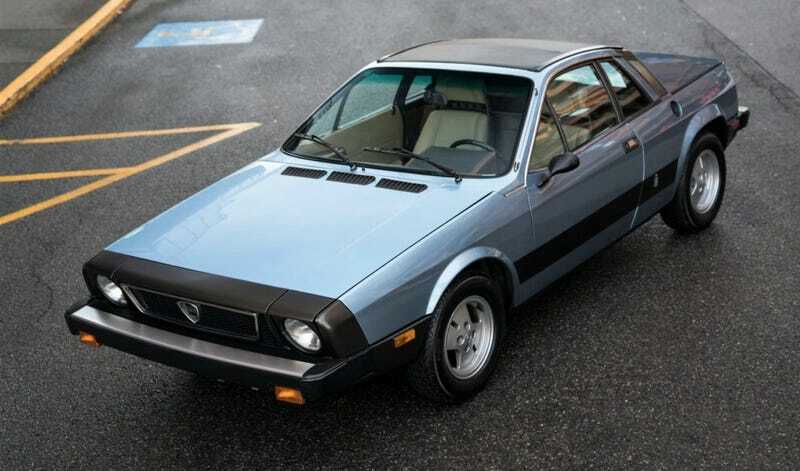 For $2,125, Could You Picture Buying This 1976 Lancia Scorpion Movie Homage Car?